Use prebuilt dashboards to find answers to audit questions. Set email notifications when KPIs hit specific limits. 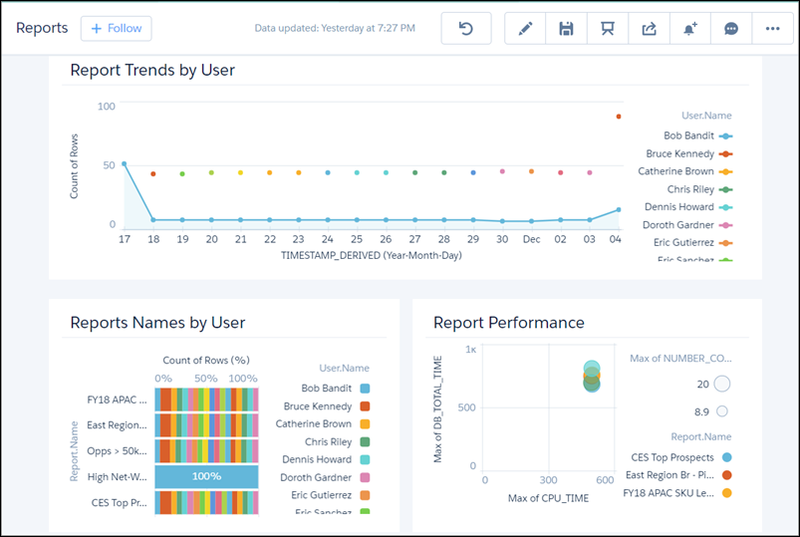 As the Salesforce admin for DTC Electronics, you’ve set up Event Monitoring Analytics. It’s working the way you want, so now it’s time to get ready for your upcoming meeting with the CIO in a couple days. Let’s take your dashboards for a test drive. And you know that your CIO has an inquiring mind, so try to anticipate other questions she can have and answer them before she even has to ask. You also explore some of the other cool things that the app lets you do. Along the way, you discover just how easy it is to use Event Monitoring Analytics to gather key insights and take action on them. 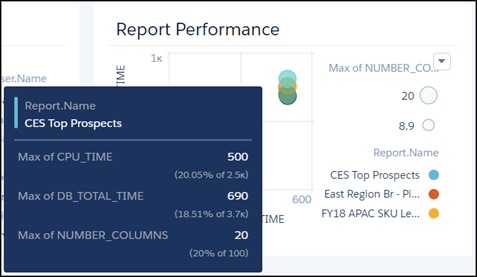 Let’s use the Reports prebuilt dashboard to see the top viewed reports, spot performance problems, and identify the users who use the reports. Open your Analytics for CIO app, if it’s not open already. Take a look at the Report Trends by User area in the dashboard. The chart tells us the number of reports downloaded by user in the last 30 days. Hmm... looks like Bob Bandit downloaded many reports on November 17. Let’s investigate further. Let’s look at the Reports Names by User area in the dashboard. 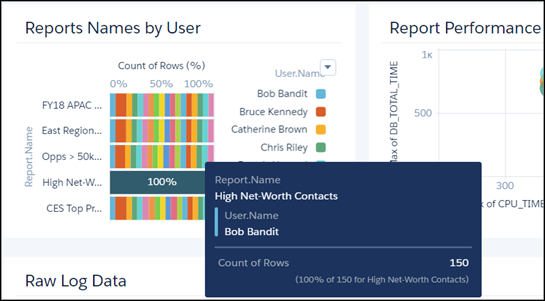 High Net-Worth Contacts is a popular report with a single user—whom can it be? Hover over the report name in the grid to see who accessed it. It’s Bob Bandit! Looks like Bob Bandit accessed the report a total of 150 times during November. Definitely noteworthy info to discuss with your CIO in your upcoming meeting. We’ve already denormalized the data here for reports. Denormalizing means that we’ve optimized the dashboard by adding extra data to add more meaning and context for our business case. We get into how to do that in the next unit. Now that we’ve spotted some report download trends and possible security breaches, let’s turn to a milder topic—how to spot performance problems with reports in your org. You don’t want your users to be frustrated with report performance, and you also don’t want your overall org performance to suffer with super-long queries. Let’s take a look at the Reports dashboard again. The Report Performance area shows the ratio of DB_TOTAL_TIME to maximum CPU_TIME. What do these mean? DB_TOTAL_TIME is the time in nanoseconds for a database round-trip. CPU_TIME is the CPU time in milliseconds used to complete the request. This measure indicates the amount of activity taking place in the app server layer. Compare the DB_TOTAL_TIME to CPU_TIME to determine whether performance issues are occurring in the database layer or in your own code. In the example above, you can see that the CES Top Prospects report has a high database time as well as a high CPU time. The report might benefit from query optimization. In the previous section, you learned how to spot report performance problems using the Reports dashboard. Perhaps you also noticed that the database and CPU time are reported as KPIs at the top of the Reports dashboard. Cool, huh? 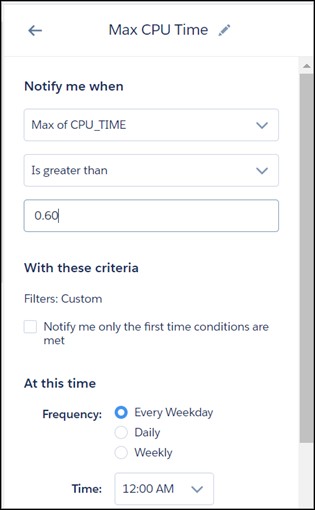 Now that you know what DB Time and CPU Time mean, you can spot performance problems by reviewing the KPIs periodically. Let’s send an email when our maximum CPU time reaches 600 ms (shown as 0.60 in the KPI). On the KPI, hover over Max CPU Time, click the menu arrow, and select Set Notification. In the notification area, enter 0.60 as the threshold value, change the operator to Is greater than, and leave the other values as is. Keep the default notification time and day. When you created your Event Monitoring Analytics app, you manually started the dataflow to get DTC Electronics data in your app. To ensure that your app uses up-to-date DTC Electronics data, schedule the dataflow to be rerun every day. Salesforce generates and uploads event log files in the early morning, usually at 3:00 AM in the time zone where your Salesforce instance (like NA7) is located. Schedule the dataflow for at least a couple of hours after that so the app has the latest data and the dataflow doesn’t interrupt your use of the app. We recommend running the dataflow between 8:00 and 9:00 AM to make sure that you start your day with refreshed dashboards. Let’s schedule it to run automatically at 8:00 AM every day. 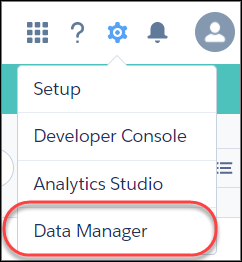 Click the gear icon in the upper right, and select Data Manager. Navigate to the app Analytics for CIO. Open the menu on the far right of the screen next to the app icon and name. 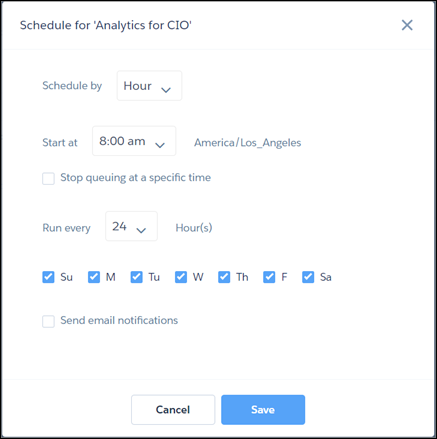 Select Schedule, and set the time to 8:00 AM, which is outside your business work hours so the dataflow won’t interrupt business activities. Run every 24 hours, every day.